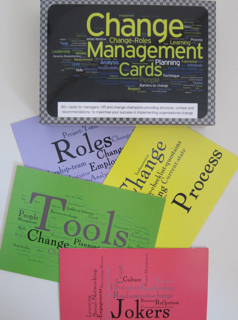 This set of cards contains over 80 cards describing change principles, change processes, change roles and change tools, designed to help change managers plan and implement successful change. Designed by our partners at the Change Management Toolbox the Change Management Cards provide a fresh alternative to that intractable problem of how to engage people in the change initiative. They are designed to engage your people, help them understand the need for change, and work with them in a structured way to socially construct a future state that will achieve sustainable business outcomes. The Joker cards articulate key cultural areas critical to successful change. The Process Cards outline processes that you may need to go through whilst defining, developing, implementing and reviewing your change initiatives. The Role Cards provide the detail of key roles that you need to consider. They give you the opportunity to clarify responsibility and accountability issues with teams in a constructive way. The Tool Cards provide you with descriptions and contexts of over 50 tools that have helped maximise the success of change in many organisations. These tools are designed to address a broad variety of challenges that arise during change initiatives and can be used in conjunction with the Jokers, Process or Role cards. The ways that you can use these cards in your team or organisation is only limited only by the collective imagination and intelligence of the audience. Although they are a powerful tool to enable the social construction of a way to embrace change and the future, they can also be used by individual leaders and practitioners to inform their initiatives during development and implementation of change. To get a free preview of the cards, download the iPhone App.